THE HITS KEEP COMING Deputy Chief Financial Officer Al Weidner discusses budget matters with the School Board late last year. Photo by Scott Proffitt EXTRA SCHOOL FUNDING INITIATIVES APPROVED BY THE LEGISLATURE POSE MORE HEADACHES FOR THE SARASOTA DISTRICT By Scott Proffitt Staff Writer During the May 21 Sarasota County School Board workshop, Al Weidner, the deputy chief financial officer for the district, once again made the case for further cuts to the Fiscal Year 2014 budget — with the Florida Legislature this year having created more school-related mandates without providing money for them. "Tax rolls are supposed to go up by 12.5 mills," noted Weidner. "The Legislature funded our teacher pay increases by raising local taxes," School Board member Shirley Brown, who previously served in the Legislature, summed it up. The Legislature funded our teacher It also approved an pay increases by raising local taxes. increase in the local millage rate — a responsibility it handles by law. 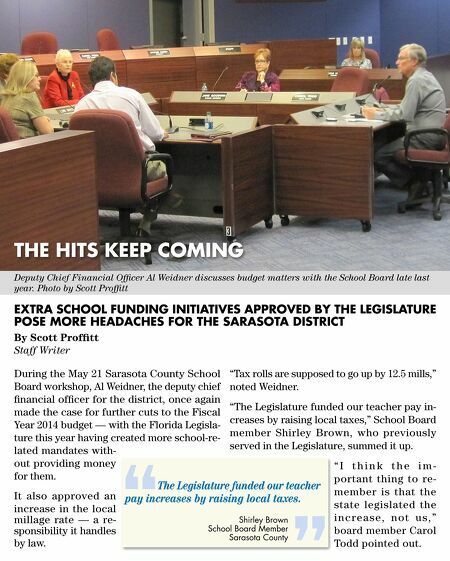 Shirley Brown School Board Member Sarasota County "I think the important thing to remember is that the state legislated the increase, not us," board member Carol Todd pointed out. A resort without a future?